Dreamer is Toby's favourite song! We look forward to delicious coffee with you all next time we are in Switzerland! Bitte Unsere Belohnung beim Luli deponieren--nur nicht nach Kanada schicken! Wunderbares Album, Musik für jede Gelegenheit! This project ended successfully on 4/9/2014 18:00! JUNES Last Night Castellano – signed new CD one week before official publication. JUNES Last Night Castellano – signed new CD and two exclusive bonus songs in your mailbox. JUNES Coffee Talk. We love coffee and we love to philosophize. Let us combine this. You are invited to Rorbas for a cozy Coffee meeting. We will show you the Studio in which «Last Night Castellano» has been recorded. JUNES collection package with the CD albums «Last Night Castellano» (new), «Don’t Leave Me In Autumn», «Consequences». All signed. JUNES collection package with the CD albums «Last Night Castellano» (new), «Don’t Leave Me In Autumn», «Consequences» and a JUNES T-shirt (women- or man-cut). All signed. 2 tickets for the JUNES «Last Night Castellano» release concert – only for invited guests. JUNES live in your home. We bring our instruments into your house. Invite your friends or give the concert to someone special. JUNES aus der Ostschweiz. 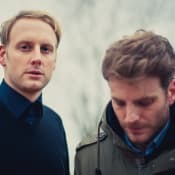 Im Ursprung ein Duo aus Marc Frischknecht an der Gitarre und Daniel Hauser am Piano. Seit 2005 schreiben wir zusammen Songs und spielen mit weiteren Musikern und Freunden wie Philipp Schmid und Lukas Speissegger auf Schweizer- und Internationalen Bühnen. Dank der Unterstützung von vielen Zuhörern sind bereits drei Alben von uns entstanden. Das 4rte Album kommt im Herbst.